Paul alludes to Leviticus 19:18: the Law is fulfilled in one commandment, “Love your Neighbor As Yourself” (Gal 5:14). To fulfill the Law is not to “sum it up” but rather to complete (Note1). The verb “fulfill” (πληρόω) in verse 14 is a perfect passive, indicating that the completion of the Law has already been accomplished when believer “loves his neighbor as yourself.” Paul’s point is that if one is loving one’s neighbor as themselves, then they are already doing the “spirit of the Law.” By walking in the Spirit the believer is already fulfilling the whole law, but the requirements of the Law were never required for the Gentile believer in Christ (Witherington, Galatians, 381). There was a lively debate in the first century on how to sum up the law, Jesus deals with this when he is asked what the greatest commandment is (Matt 22:34-40). There Jesus says that the Law and prophets “hang” on these two commandments, perhaps “hinge upon” is another way of translating the verb. This verse is the most quoted verse from the Pentateuch in the New Testament, despite the fact that it is almost never referred to in contemporary Jewish texts. Perhaps this is because Jesus himself stressed love of neighbor as a fulfillment of the law! Paul’s point is not, “if you want to keep the law, love your neighbor.” He has said repeatedly that the age of the Law is done and over with and the one who is in Christ is free from the Mosaic Law. My guess is that most contemporary Christians think that by loving their neighbor they are somehow keeping the Law of Christ. What motivates “loving your neighbor” seems to be the main point here – why do you serve others? If it is to keep a “Law” or because it is “expected of you,” then it is possible you have missed the point altogether. Note 1: A number of manuscripts (including D F G and the Majority text) have πληροφορέω, often used with the sense of fulfilling prophecy. The 12th century mss 365 has ἀνακεφαλαιόω , to “unify” or “sum up.” The UBS text is more likely, with support from P46 and A B C.
← Galatians 5:1 – Why Legalism? The more and more I learn about Paul, the issues he faced, and the early days of Christianity, the more I realize how big of an issue following the Law was to Jews and Judaizers. Paul understood the Law, and at one time believed it to be the way. But after his conversion, he knew that Christ was the way. In a number of his letters he explains that we are no longer held to live under the Law. This was something that was very hard for the early Christians to grasp, and some wouldn’t even consider doing so. We see good example of this in the Galatian Judaizers who were “falling away from the way of grace into the way of the law” (Polhill 139). Jesus didn’t come to abolish the Law, but to fulfill it. The Law wasn’t a bad set of commandments. They were as Andrew Farley describes them in his book, The Naked Gospel, perfect. The problem was that because they were so perfect, we as humans could no matter how hard we tried live up to the Law. We would always fail. That doesn’t mean we still can’t try to live by it. Paul understood this concept. Christians today are stereotyped as being many things, but loving is often not one of them. In fact a lot of the time we are perceived as the exact opposite. In my opinions it is one of the saddest things about Christians today. Even sadder is that quite often it is true. We need to remind ourselves of that Jesus was all about love, and as Christ followers we need to be the same way. I agree with what you’re saying here Mitch. I totally believe that Jesus came to complete or fulfill the Law and not make it irrelevant. It’s also good to point out that Jesus loved. He loved everyone He came in contact with, thus loving His neighbor. His example is enough for me, but His words solidify His actions. What if the answer was neither? What if we loved others for the simple fact that He loved us first (1 John 4:12) and we cannot help but be overwhelmed with compassion and love for others that we serve them? What if loving and serving others was not a feeling or an action we “accomplished” because we wanted to feel better about ourselves but because we love God (first) so much that we can’t help but love and serve others? What if serving others wasn’t about the server anymore? Maybe that is the “fulfillment” Jesus accomplished. It changed from loving your neighbor because it was about the “server” fulfilling the requirements of the law and changed to loving one’s neighbor because we now have a faith and love for God that we can not help but put others ahead of ourselves. I really like this point of neither. The best way I can tackle this idea is to relate it to the relationship I have with my parents. Like any home, mine has rules, and i obey these rules because i love my parents. My parents might, “expect this of me”, but that is not why I follow the rules. I follow because of love, and Love because I was loved first. I know I am not supposed to write a post like this, but i really love Joe’s post. I feel like I serve others not because God wants me to keep the law, but because I was loved. Paul wanted to make sure the Galatians understood that they needed to serve because of this great sacrifice that Jesus fulfilled, and not because it was “the law”. The Judaizers were all about making the Galatians follow the law because it was “required”. This upset Paul because it completely contradicted the message he was giving. He often wrote specifically opposing what the Judaizers were teaching.”To the very end of the letter Paul held his ground againts the Judaizers” . (Polhill 153) So I would agree with Joe saying, “neither”, and I think Paul would too. Oh golden rules. It seems every religion has their own, and Christianity is no different. This is why I am glad I’m not part of the Christian “religion” but part of a relationship with the man that said this golden rule. The reason that I serve others is easy, because it makes God happy, because it makes others happy, because it makes me happy. I find it odd that people would serve just to make God happy, but i suppose that is something that happens on a daily basis considering how self conscience people are. They figure, if I can serve others, then others will like me, then I will feel better about myself. So on and so forth. Matthew 20:28 says “just as the Son of Man did not come to be served, but to serve, and to give his life as a ransom for many.” This sums it all up rather well. Freaking God’s son died for us and served us. He served us puny pathetic worthless humans simply out of love. So I think I can manage to serve someone else once or twice in my life out of love. We serve others to glorify our Father. And I believe that serving others is both a law and an expectation for the followers of Christ. I really like what Joe said in that serving others should be a result of an outpouring of gratitude we have for what Christ did for us. Scripture tells us that even righteous deeds are filthy rags when done on our own (Isaiah 64:6). I am under the conviction that serving our neighbor is one of the greatest ways in which Christ draws outsiders to himself. The reason we are called mimic Jesus’ life on this earth, a life overflowing with love and service to others, is the same today as it has always been. Jesus told us this reason himself in Matthew 5:16, “Let your light so shine before men, that they may see your good deeds and glorify your Father in heaven.” Our serving should be done out of the transforming work that God has done and is continuing to do beginning with salvation, however, if we leave it at that I think we miss the point. The ‘good work’ or ‘act of service’ is only the beginning. I believe that a service done out of extreme compassion or obligatory obedience is equally as important to God because God can use it to bring glory to himself. Whether or not we want to go out of the way and give a stranded person a ride home across town matters little to that person when they arrive home safely. That individual is just happy they made it home and grateful that you went out of your way when no one else wanted to. And when they question why you would do such a thing you have allowed God to begin his work. A small act of service had an end result of opening the door for God to work in a life, and I believe that is why we serve. I like what both of you have said so far. Once again I’m convinced that the message of Jesus was less about actual commandments, and more about the state of our hearts. This new way of living that Christ exemplified and preached was focused on the heart of the law, and not the letter of the law. As was already stated, he fulfilled the law, thus making it irrelevant to those who are living in relationship with Christ. The Jews, and soon the Gentiles, were being taught a way of living that was allinclusive. From how the church was being formed, to everyday living. I wonder if Jesus was preaching this concept of loving neighbors (everybody) knowing full well that the Gentiles would soon be involved in the Body of Christ. I kind of see it as a “mountain” type of preaching. At the time the Jewish people would only see the mountain directly in front of them (loving all of their Jewish neighbors equally), but there was a much bigger mountain in the distance that they couldn’t see yet (loving the Gentiles equally as well). The hearts of the people were being prepared for something that they hadn’t been doing, or taught. There was no more room for exclusion in the kingdom that Christ was preparing. No longer would there be inequality amongst the people, but Jews and Gentiles would soon be on equal terms. Gentiles would no longer be coming into relationship with God through Israle, but through Jesus Christ’s death and resurrection. In the same way we are to let Christ change our hearts to love all equally. Just as the Jewish people were being challanged to allow their hearts to change, so should we. Romans 12:2 says, “Do not conform to the pattern of this world, but be transformed by the renewing of your mind. Then you will be able to test and approve what God’s will is—his good, pleasing and perfect will.” Loving our neighbors as our hearts starts with allowing God to transform our way of thinking, then allowing the change to take place in our hearts. The commandment to love your neighbor is the second greatest commandment. But if we keep this commandment because it is what we are supposed to do then we are not actually keeping the commandment. Is it love if you are doing out of duty instead of true desire to serve? I would say no. What it all comes down to, the law and faith, is the heart. If your heart is not in the action then the action is meaningless. Jesus was very clear on this point and Paul understood that fully in his ministry. When Jesus went around showing love to the widows and the lame he did not do it out of obligation or duty. He did it because he was showing the love of His Father. Paul was asking the same thing of the Galatians. If Christians are to reflect the love of the Father then we have to mean it with our whole hearts. As Paul writes in Philippians, “Let nothing be done through selfish ambition or conceit, but in lowliness of mind let each esteem others better than himself,” (2:3). If we do anything to fulfill a law, rule, or obligation then we are not truly serving as we ought. Paul makes it very clear in all of writings related to this topic of the law that those who are found in Christ are no longer under the law (Romans 6:14). Because of that freedom we now have some heavy choices to make, the least of which would not be the choice as to whether we should be loving our neighbors a little more. This golden rule is such a solid cornerstone for our faith. We base entire churches, ministries, and lives upon a few words. Besides the fact that this statement came straight from the mouth of God incarnate, our transformation of heart should embolden us to risk rejection by loving the unlovely. Our faith should spur us on to actively showing God’s love to our neighbors. James 2:17 says, “So also faith by itself, if it does not have works, is dead.” Also, in 1 Corinthians 13:3 Paul reminds us that even if we do things that seem good in the eyes of men, or if we do them to simply make ourselves feel better then it’s not truly doing it out of love (If I give away all I have, and if I deliver up my body to be burned, but have not love, I gain nothing. 1 Corinthians 13:3). So, let love reign! I’m reminded of Psalm 26, “Test me O Lord, and try me, examine my heart and my mind; for your love is ever before me, and I walk continually in your truth.” (26:2). Let me first note, motives. The motive of one’s heart is such an important part of the Christian faith and directly relates to the freedom we find in Christ. As many have already noted, Jesus seemed to emphasize the motives of his follower’s hearts rather than outward works. (example, Mark14:1-11 ) I find myself constantly having to weigh the motives of my heart, especially when I am involved in ministry because it’s so easy to get caught up in a “works based” mentality. As if doing ministry, evangelizing, doing justice, etc is something we do to check off our spiritual to do list and put on our spiritual resume. These are all wonderful things that the Lord uses for His glory and to further his kingdom, but as Scott mentioned, they are like “filthy rags” (Isaiah 64:6) before the Lord when done with the wrong motives. Sometimes I wonder if we would even consider loving one’s neighbor as a way to keep the law of Christ if we truly grasped who our neighbor was. Jesus hung out with the marginalized in society… I believed (and still do) I had a heart for these people, but it wasn’t until I really committed myself towards investing in their lives that I saw the effects of this command that Jesus gives. I had this false sense of pride when I began working with these ones, thinking that I would be commended for my work. Unfortunately, it hasn’t always been that kind of a response. And I’ll be honest, it’s painful. One of my pastors said a few weeks back: “when we act like Jesus, we won’t always be commended as a hero. We must be prepared to take in the tarnished and be tarnished ourselves. We must be prepared that by taking in the outcast, we will become an outcast ourselves.” I’m ashamed to say, that I don’t always want to love my neighbor, knowing that this could be the response I get. No one ever said following Jesus would ever be easy, and in many ways I suppose following the law would be easier. But when our motives our pure and we are basking in the Lords love, the outpouring of His love is inevitable. Loving my neighbor… I’m sure most people will recognize (and have already recognized) that loving your neighbor is extremely hard to do sometimes. You meet people that require a whole lot more love than others, and when you have to spread that extra love around, your job only gets tougher. I once saw a skit that illustrated showing love to one another. It had two people with the love of God in their hands, and the love of God is illustrated as being the little balls of light you see in Sci-Fi movies. So both people’s love starts out as little balls. One person shares the love and the more people that they share it with, bigger their “ball” of love gets. The other person does not share their love and the ball just stays the same size. Loving your neighbor is what we are called to do as believers in Christ. And even though it is hard, God’s love is meant to be shared because the more that we love, the more that we have. Reiterating what everyone else seems to be saying here, and something to which I agree on, Jesus came not to abolish the Law but to fulfill it. (Mat. 5:17, Is. : 42:21). Because of Christ, we are not under the Law anymore. We are free because God sent His Son to die on the cross to save us all from our sins. Now that I have established tid bit I would like to transition into the question posed by Plong “why do you serve others? Is it to keep a “Law” or because it is “expected of you?” After thinking about this for a bit I kept coming to the conclusion that it is almost neither. (after writing some of this post, I noticed Joe Pedersen said the same thing and I really liked where he came from as well. He had a lot of insight on this topic). I kept trying to pick one or the other. Are we doing it because we are keeping with the Law? No…because it is clearly stated that we are not under the Law. So then we must be doing it because God expects us to do it? I also believe that this answer is no. Expectation is basically saying Law. If you are expected to do something it is because it was a law or a rule given to you that you must perform. If we are not under the Law then how can we be expected to do something? So then what is it? Why do we serve? I must agree with Joe here and say that it is because God first loved us and because were made in the image of Christ and Christ loved and served, so why shouldn’t we? Its like if we respect someone, why would we not try to be more like him/her? God loved me and because of that I love others. God served me and because of that I serve others. I also respect God. We are made in the image of His some and therefore I should desire to be like Him—serve and love one another. Christ did not come to gain recognition for himself. He served even when it was at a disadvantage for Him. He loved even when He was the only one. Out of being loved first and out of respect for the God who created our innermost being, we should desire to serve, not out of the Law or because we are expected to. Loving our neighbors is one of the most important things we can do, as others have said. The only thing that is greater is loving God. And as Jesus said, “I tell you the truth, whatever you did for one of the least of these brothers of mine, you did for me” (Matthew 25:40). So even through loving others we can love God. However, as we see in this world (and again, as others have noted), a lot of Christians are perceived as – and often are – hypocritical. We’ll say we need to love God and others and live in truth and love, but then we’ll go out and live just like everybody else. This puts us in a bad place because then we’re giving Christ a bad name and others won’t want anything to do with Him. We need to be representing and imitating Christ. If anyone knew how to love their neighbor, it was Christ! He loved the tax collectors, the Samaritans, the fisherman, the Gentiles, the little children – everyone. He loved the people other people loved to hate. He loved the adulterous woman, even when the Pharisees were scowling at Him for doing so. Ultimately, His great love for His sinful “neighbors” was to die for us, giving all of Himself. Even so, we ought to give all of ourselves in loving others, realizing that we are loving God Himself in the process. Love really is the strongest and most powerful emotion. Christ instilled this emotion into all of us, and depending on what experiences we have in life will alter the emotion of love. Through life, we, as people, have this emotion changed. Sometimes we might have less compassion and love for someone because of something that they did so us. Since life if full of these kind of let-downs, we would have no love for anyone because we all fall short of expectations. Whe Christ died for us, he restored that love and compassion that is being diministed from our daily lives. For example, driving on the express-way can get frustrating if other people cut you off, or do not use their blinker. We would all get mad and have no love or compassion for this person because of what they did to us, but because of what Christ did for us, we are able to resonalby soften our hearts, and way to ourselves, “Christ loves them to”, or “I have done the same thing at one point”. I think that Christians often show love to their neighbor because it is politically correct, so they look good in front of others or because they know it’s the right thing to do. Our culture says we should treat others that are different from us (in terms of race, religion, sexual orientation, etc.) with acceptance and love. It’s ‘cool’ to adopt children from other countries, help out with disaster relief, and go green. Our culture in America has its own laws that we feel like we must follow to seem like good people to others. I think that this motivation falls short though. Only when we realize that our love should be an outworking of Christ’s love for us, will we have the correct motivation. 1 John 4:19 says we love because he first loved us. I think that Christians forget this sometimes. Polhill captures this point by saying that, “People who love do not abuse their freedom in their relationships with others” (Polhill 151). Treating others as we would like to be treated is an act of love that can be difficult to truly accomplish without relying on God’s love for us. I would have to agree with just about everyone’s postings. I like what Tina said “Christians often show love to their neighbor because it is politically correct”. It is true that we are shallow, and sometimes we forget why we really do things. Do we love people because it is the “right” thing to do and because someone told us to, or do we love people “because he first loved us” (I John 4:19)? Loving our neighbor should not be done because we are trying to keep the law, because law was our “…guardian until Christ came that we might be justified by faith. Now that this faith has come, we are no longer under a guardian” (Gal 3:24-15). We do not adhere to the law, for we have been “bought for a price” (I Cor 6:20), and are now freed from the law. So the law should not be the reason we love anyone, nor should “expectations” because that is shallow. No, rather we should love and serve others because Christ loved us first, and He has set before us a grand scale model of how we should live our lives – and we should live them as a loving sacrifice to Him. In Galatians 5, Paul wrote about the freedom that the believers had in Christ. Then he goes on to sum up the Law in one statement saying: “Love your neighbor as yourself” (5:14). There is no mistake in putting the freedom we have in Christ with this statement. Indeed, there is freedom in Christ, but that does not mean people can do whatever they want to do. They do not have to follow the Law, but this summary of the Law is very important. And perhaps the most important part of it is the motivation behind following this. It is not merely a rule, it is a way to act toward others and how to live. It is more concerned with the attitude of the person and that attitude will translate into other parts of their lives. One question that you brought up was what exactly one’s neighbor meant. There are many times Paul uses that when saying brothers in Christ, but I agree that it is anyone in need. Sure Paul says that we ought to love our brothers and sisters in Christ, but this should extend to all of those around us too. Following this comandment will not get anyone into heaven. However, it is something that becomes natural to those who are being lead by the spirit. If one has to keep a check list of all the rules to follow it is not coming naturaly. Just like when one is in a job and there are so many rules to doing your job. You do not have to look at the rules all the time they just become second nature because that is your job. Same here. Christ loved us while we were still sinners and we as Christians are called to love others. We are the salt and light of this world. We are the moon reflecting Christ, what better way to do so than to show love to our neighbers. To love your neighbor as yourself has always been something that I’ve heard from my mother, whenever I did something wrong to someone else. She didn’t always say it like that, it always went something like, “do unto others what you want done to you”. Loving others and treating them nicely shouldn’t be done out of an obligation to a law or just because. We should be doing it out of love for God and wanting to serve others. If we truly love God and want to please him, we will want to serve others and show them His love through us; it should be a natural response for us. “Beloved, let us love one another, for love is from God; and everyone who loves is born of God and knows God. The one who does not love does not know God, for God is love”, (1 John 4:7-8). This is not saying we have to follow the law of love or anything like that, but because of God’s love for us, and our love for God, it should just be a natural response. Where then does this attitude come from, as a means to follow the law, or as a means to live by the Spirit? “But if you are led by the Spirit, you are not under the law.” (v18) Later we find in the fruits of the Spirit against such things there is no law. I believe Paul is making an appeal to love and serve not on a basis of following the law; however as a means to walk in the Spirit of Christ. If our main objective is to glorify God (1cor10:31) and to become like Christ (Eph1) we follow the example Christ set before us. He gave us the parable of the Good Samaritan as a means to take care of others in need. He also exemplified service to us in washing the disciples feet at the last supper. If we are to put on the attitude of Christ Jesus (Phi 2), love and service will come forth from our lives. “Do nothing from selfishness or empty conceit, but with humility of mind regard one another as more important than yourselves.” (Phi 2:3) Also Christ did not come to be served, but to serve. Our motivation to serve others comes from the Spirit of Christ. The love of Christ compels us to serve. This is not a means of following the law, but being motivated by being ‘in-Christ.’ I remember listening to a radio station that the men were talking about the greatest commandment, to love God and to love others. The comment was made that these two things are inseparable. To love God has a direct connection with how you love others, and the men were bold enough to say that the way you love others is in direct connection to how you Love the Lord. I had never thought of it that way, but it is a great thought to add to our motivation in serving. The motivation that drives a Christian to love their neighbor is likely the fact that Jesus Christ expressed the importance, not that it is a law they have to abide by. If someone truly is a Christ follower that is what they would do, because he reflected it throughout his life. With this said, I do not feel that the thought of someone loving their neighbor as keeping the Law of Christ as a wrong thought. As Paul explains in Galatians 5:13, we have a freedom, and we can use that freedom to abide by this command, or to indulge in sinful desires. “People who love do not abuse their freedom in their relationships with others” (Polhill, 151). If someone chooses the route which Christ wants us to choose in loving our neighbors, it doesn’t matter whether you think of it as abiding by a Law of Christ, or just doing it in love, since you have the freedom to choose in the first place, and I almost feel someone is already doing something “in love,” if they are doing something to abide by what Jesus Christ said to do. For instance, sometimes the flesh creates an attitude in someone that makes him or her not want to love his or her neighbor at all. In this case, it is tough to say you are doing something without the motive of it solely being a command of Christ, since you yourself do not want to show love (if that makes sense). It is not like loving your neighbor is only reflected in Christian folks’ lives though, as through personal experience I have been around people that are very caring, loving people; they don’t believe in Jesus Christ. In my mind, this is the kind of love that may miss the point altogether since all their kindness and love in the end, when put bluntly, may turn out worthless. Great point here, P. Long. I have always been puzzled as to why so many people feel that they can fulfill the law by loving others. Christians today want to follow the law without actually following the law. They do not want to have to take the time to study or live Torah. They just want to feel good about themselves because they are loving others once in a while, but people who love in order to live lawful lives are being decieved. The law is fulfilled in Christ. It is not required for the gentiles. But, we still should love our neighbors because that is universally a solid truth and expectation for those who wish to live as Christ-like disciples of Jesus. It is also important to note certain passages that say something along the same lines as this Galatians passage. We can see it in the “Golden Rule” in Matthew 7:12. This is also in Luke 6:31. Paul adds in Romans 13:8-10, “Owe no man any thing, but to love one another: for he that loveth another hath fulfilled the law. For this, Thou shalt not commit adultery, Thou shalt not kill, Thou shalt not steal, Thou shalt not bear false witness, Thou shalt not covet; and if there be any other commandment, it is briefly comprehended in this saying, namely, Thou shalt love thy neighbour as thyself. Love worketh no ill to his neighbour: therefore love is the fulfilling of the law.” we see here that through loving others we will follow the law and through obeying the law we love others. Love is intertwined through all of the law. Love is the basis of all morality and what Christ’s point is, is that love should be the standard by which all human interaction is defined. Some Jews were zealous for the law. Now, they should be zealous for love. I have never thought of “Love your neighbor” as being a law. It is something I have always tried to do. I guess I thought of it more in the sense of “treat people how you want to be treated”. I want to feel loved so it would make sense to love others. It was basically the “golden rule” throughout elementary school and something that we were told to do. In that sense, I thought of it as a rule but when reading it in the bible, I did not. I would agree with the idea of loving our neighbor because He loved us first (1 John 4:19). That makes the most sense to me. God is the ultimate example and to follow His example, is something we should strive to do. I first of all believe that when the word neighbor is brought up in Gal. 5:14, or any where else in the Bible for that matter, it is meant as anyone we come in contact with. It is not just the person down the hall, or across the street from us. But it all people we are surrounded by. That being said, we are to Love those people, just as Christ loved us. As said in John 13:34 “A new command I give you: Love one another. As I have loved you, so you must love one another.” But how do we love these people? My honest opinion is that we are to show the love and compassion. We need to have that Christ like attitude. Jesus went and hung out with the drunkards, and the tax collectors, the prostitutes, and sinners. He loved them and showed them LIFE. We should take that example and show todays people a loving way of what LIFE can look like for them. In light of answering P-longs question What motivates “loving your neighbor” seems to be the main point here – why do you serve others? If it is to keep a “Law” or because it is “expected of you.” I would also say it is neither one. Jesus says that our greatest commandment is to love the Lord your God, with all your heart, with all your soul, and with all your mind, Matthew 22:37. I would take this a step further and say that we serve and love other because God first love us. Romans 5:8 says that God demonstrated his love in this that while we were still sinners Christ died for us. That is, while we were still shaking our fists at God, He still loved us dearly. FOr me to say I only serve other becuase it is expected of me or to keep the law, is foolish. I do it because God first loved me. When Jesus came to earth, He did not come in order to abolish the law, or make it irrelevant, he came to fulfill it. If you keep reading after verse 14 it goes on and says in verse 15 that “But if you bite and devour one another, watch out that you are not consumed by one another (Galatians 5:15)”. If we do not love our neighbor as ourself we should not expect anything less in return. Polhill seems to think “He may have meant something Like the “Law of Christ” in Galatians 6:2 (Polhill 152)”. Whatever the case is, whatever “law” Paul is referring to there is definetly a disconnect into days world for loving your neighbor as yourself. No one seems to o this anymore, besides a select few people who take this seriously. People just don’t care, and keep to themselves mostly. I don’t know why, maybe the fear of being hurt, or the fear of the unknown. Possibly even the fear of the uncomfortable would keep them from living it out. Whatever the case there is definitely a distance between what we should do and what we are doing. I believe that loving our neighbor is expected of us, but that this should not be our motivation to do it. As children, we are expected to do our chores. As students, we are expected to do our homework. Neither of these situations truly motivate us to complete the “task.” The reason for “loving your neighbor” is seen in 1 John 4:19-20: “We love because he first loved us. If anyone says, ‘I love God,’ and hates his brother, he is a liar; for he who does not love his brother whom he has seen cannot love God whom he has not seen.” That being said, we must not simply act on this fact alone. The love needs to be genuine. I think that this is where the question truly lies. When we are “loving our neighbors,” is the love genuine like Christ’s love for us? We should expect it of ourselves. We should be dissatisfied when we see ourselves harboring malice towards others. Our motivation to love our neighbors should be to exemplify our Savior that gave his life for us. 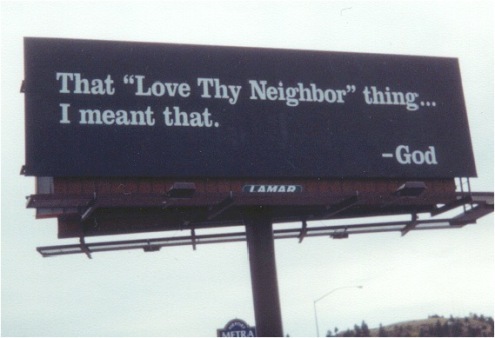 First off, I would like to address the issue about if loveing your neighbor is truly the most important commandment. If we think about it, every sin what we commit involves this commandment. Thoughts of lust, are not loving to our neighbor if they are about them. Swearing, is not loving our neighbor if we swearing around them or at them. There are many other examples of how this commandment is the center of how God wants us to act. Secondly, I like how we are talking about the idea of what a neighbor is. It is something that needs to be considered especially during the time frame. I do agree that it was ment for the Jews as neighbors, but after the death of Christ, this commandment took a whole new meaning. “To love him with all your heart, with all your understanding and with all your strength, and to love your neighbor as yourself is more important than all burnt offerings and sacrifices.” (Mark 12:33). In Leviticus, the meaning of neighbor take on a whole new meaning. It is considered to be your neighbor Jew. But when Christ died for us on the cross, the meaning is changed. In the Old Testament, loving your neighbor can be taken into considereation as being part of the Law, which it was at the time, which is where the context of the Jews being your neighbor. After the death of Christ, it is taken differently. We are loving our neighbor because if what Christ did for us. He was dieing for His neighbors and giving HIs life for us. When we think of what our neighbor is now, we should think of it now as everyone, because that is who Christ died for. In that sense, we are moving from the mind-set of keeping the law, to a change of heart, because of Christ’s act for us, not because of what was not done for us. Loving your neighbor is something that we see referenced throughout the bible — albeit in different ways. Paul says it directly in Galatians 5:14, but we also see it in Leviticus 19:18, Mark 12:31, and in Romans 13:8, which says “Owe nothing to anyone except to love one another; for he who loves his neighbor has fulfilled the law.” I like the straightforwardness of that versus’s wording, but there’s plenty of other places in the bible that point to it. The shema tells you how to love and honor your God, while the rest of the commandments are a set of guidelines on how to love your neighbors. It’s been embedded in the bible since the beginning that we, as a human race, are to love each other. We show God’s love through our love to each other, and we can see Jesus pointing this message out when he talks about showing him kindness in Mark 25, where he’s really talking about showing love to the needy and to others. Because of sin, we’re much more apt to hate. Love is the grace that Jesus showed all, and it’s a love he taught me. To me, that’s what makes it right.